You can always rely on LBK regarding the icons subject You're knowledge is really amazing. You wrote about the hymn to the Theotokos from st. 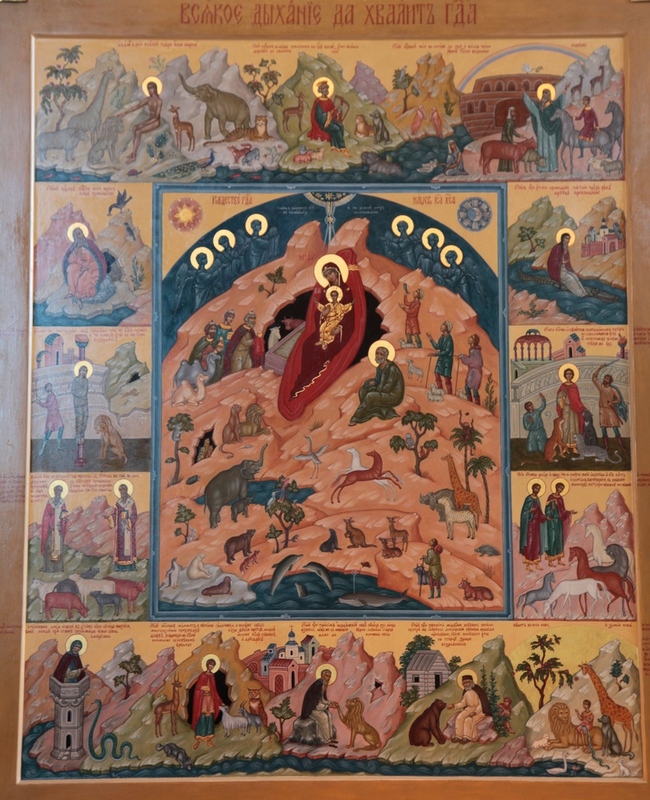 Basil's Liturgy, so I have a question: is there any difference between the icons "Assembly of the Theotokos" (Sobor Bogorodici) and "All creation rejoices in you" ("O Tebe radujetsja")? Is it actually the same icon or they're distinct but with some differences? The different names refer to the same icon type. I d/l it and thanks. Given that these creatures are so closely associated with the throne of God, it seems problematic to see them surrounding an assembly of saints. IIRC this was discussed earlier in this thread, or in the Schlock Icons thread. Being a schlock guy, I like it. 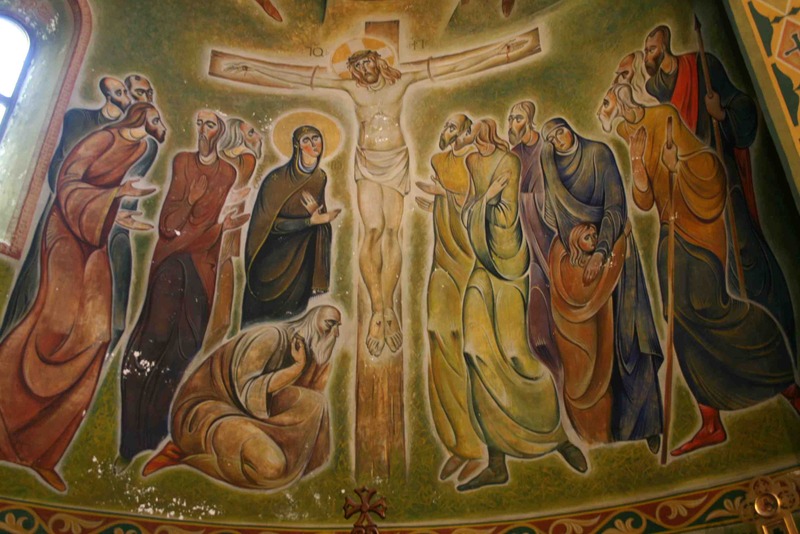 And what can you tell LBK about the Gregorian fresco I'd posted earlier in this thread; is it "correct" to depict the people in icons in such shape and with these a kidn illuminations (?) ? Or is it just a Georgian type of icons that's not familari for Slavs, Greeks, Arabs etc. ? 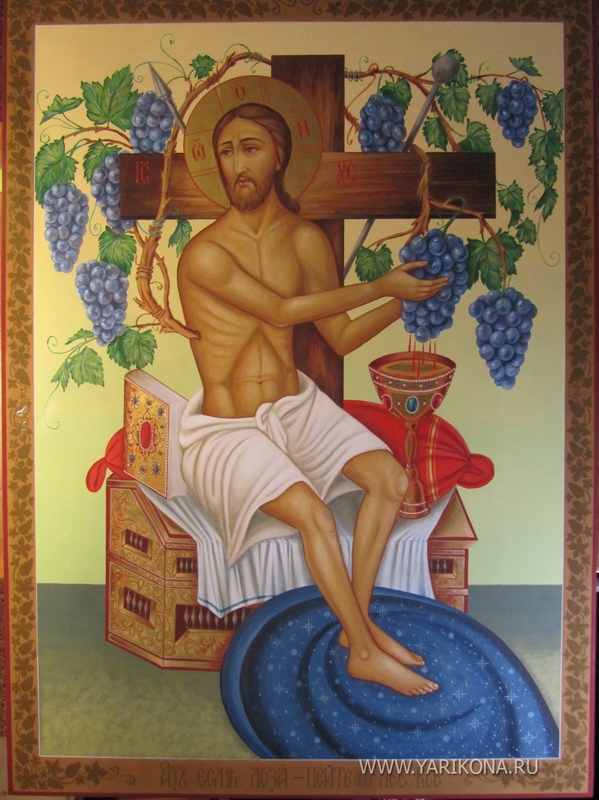 I'm not very familiar with traditional Georgian iconography, most of the Georgian icons I've seen would have been painted quite recently, so I can't say how faithful the image you posted is to traditional styles. This type of icon is common in Romania and other places. Nothing strange or schlock about it. No, this is definitely not a traditional Georgian style. That said, I kinda like it. On great feasts it was the custom of Irene to keep vigil in the courtyard of the monastery, giving thanks for the awesome beauty of creation. During one of these vigils one of the nuns, who was unable to sleep, left her cell and entered the courtyard. The nun was blessed to see Irene motionless, in prayer and levitated a metre off the ground, with two cypress trees bent to the ground before her. After Irene had finished, she blessed the trees and they returned to standing upright. At first, the nun thought this to be a vision of the evil one. Afterwards, when others of the sisterhood noticed handkerchiefs at the top of those trees, the nun who saw Irene related what she saw. In response to this the whole sisterhood was so excited that Irene rebuked them, focusing on the need for concentration of their own prayer rule and ordering them not to relate any miracles until after Irene's repose. This was painted by a Greek, who has called it Mother of God "Bringer of Hope". I'm in no doubt that, apart from the well-known depiction of the Mother of God enthroned, this composition is of his own making. You're quite right. There's far, far too much going on there. The actual Annunciation is lost among all that frou-frou. ^^ As always, thx LBK for info. 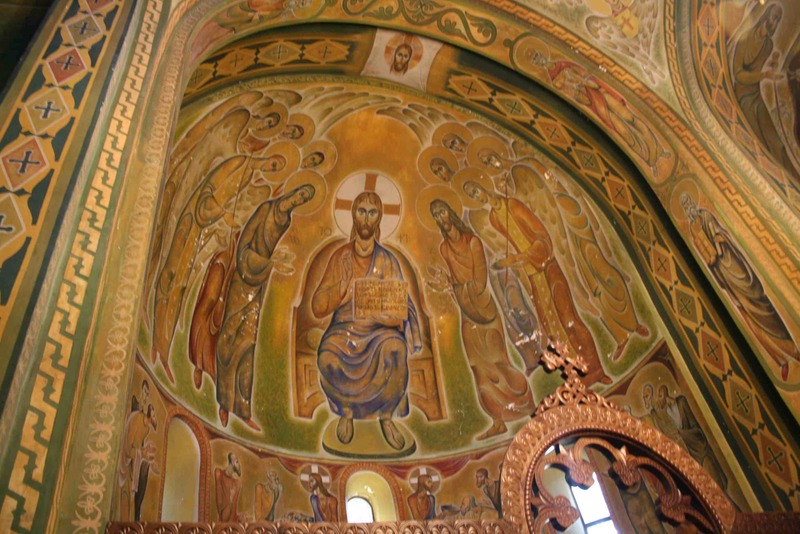 Is this icon "Bringer of Hope" placed in any church? 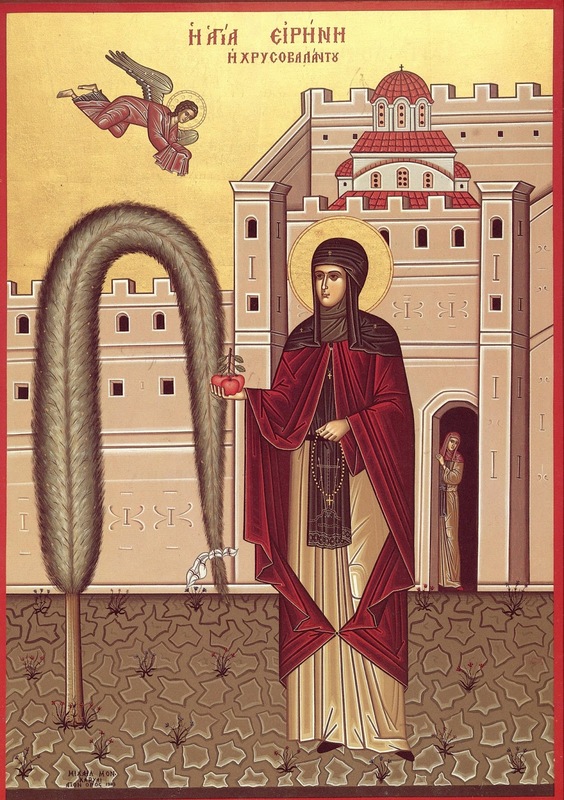 Pray for us St. Irene of Chrysovalantou! I know that the usual 'Holy Family' icons are uncanonical, but is this acceptable? Barely. The supplicatory arrangement of the Mother of God and St Joseph is fine, but two details are problematic: why is St Joseph pointing to himself? And why is his hair brown, not white? I think the gesture you interpret as "pointing to himself" is actually him holding his staff. His hair seems to pretty clearly be gray to me, certainly not the the brown hair of a young man. I think the gesture you interpret as "pointing to himself" is actually him holding his staff. I'm afraid it isn't. St Joseph's fingers are pointing to himself. His fingers would be closed around the staff if he were simply holding it. His open hand should be gesturing to Christ in deference, not to himself. His hair seems to pretty clearly be gray to me, certainly not the the brown hair of a young man. Look more closely. The saint's hair is a light brown color, with darker brown lines to delineate features and shape. There are only a couple of white highlights, certainly not nearly enough to suggest the hair color of an aged man. 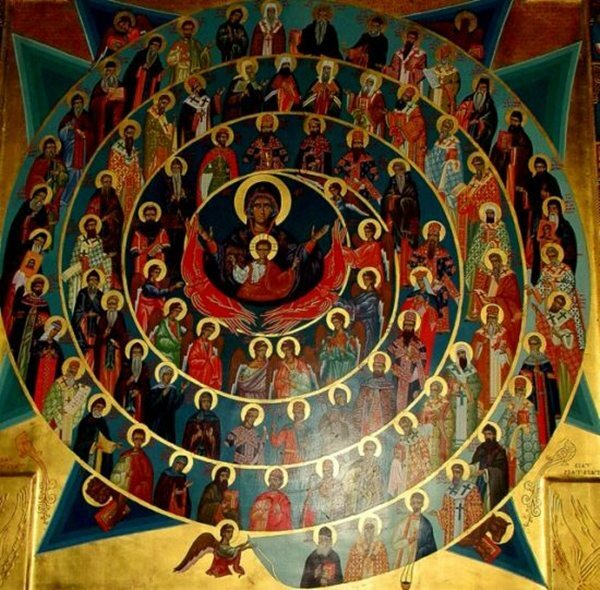 I like the giant hand of God throwing the Holy Spirit at the Theotokos like she's a dartboard. I suppose you're right about the first point. That index finger is loose. I still can't see how the hair is light brown, but I guess that we all see colors differently. Either way, I suppose I won't spend $15 on that icon. Thank you for the assistance. It would have been better to show him vested as a bishop, holding a medicament box like the ones seen in icons of other physician-saints. He looks like Father Matthew Tate of the OCA. The link doesn't appear to be working. The composition is a pretty standard one of the scene, and was probably painted somewhere in rural Greece. Rustic, but not a strange icon at all. More like wondering why this is Gay when you're Straight. Again, not a "strange" icon. It shows various aspects of the Virgin's nativity story: the prayers of Sts Anna and Joachim to God to give them a child and overcome their barrenness, and the angels announcing to them that God has heard their prayers and they will conceive; the conception (shown by the saints embracing); the birth; and the washing of the newborn child by midwives. 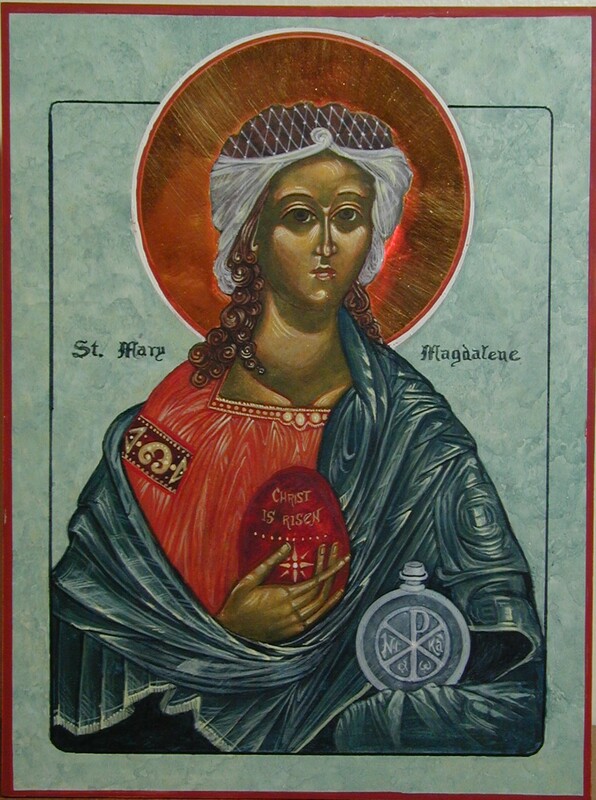 What is "strange" is that the icon is painted in a Russian style, but with Arabic inscriptions. It's not only common in iconography, but it also expresses the timelessness of the events. Linear time as we know it does not exist in heaven, just as icons are/should not be not painted in a naturalistic way using linear perspective. It is indeed schlock. Among other problems, it shows Tsar Ivan IV (Ivan Grozny) and Rasputin as saints.